A woman who died from an undiagnosed heart condition after giving birth could have been saved if it had been spotted earlier, a hospital said. Selwa Romedan collapsed and died four days after the birth of her daughter at St James's Hospital in Leeds. It was later established the 21-year-old had a narrowing of a heart valve, with an investigation finding she may have survived if it had been diagnosed. Leeds Teaching Hospitals NHS Trust has apologised to Ms Romedan's family. Ms Romedan and her partner Muhanad Adem fled from Eritrea, north Africa, and settled in Leeds after being granted asylum in the UK. In the days before her death, she suffered chest pains and shortness of breath and was told by hospital staff she was anaemic and tired. She was given a blood transfusion and told to rest, but it later emerged she had mitral valve stenosis. She collapsed in the early hours of 25 September 2016 after getting up to feed her daughter Sadenselwa and telling Mr Adem she could not breathe. He said: "It makes it worse knowing that they could have done something to save her. "We came here to be safe and I put my trust in them." Dr Yvette Oade, acting chief executive at the hospital trust, said Ms Romedan had shown no symptoms of an undiagnosed serious heart condition during her pregnancy or the baby's delivery. "[The investigation] concluded that, if the condition had been diagnosed earlier, then treatment would have been provided for this," she said. 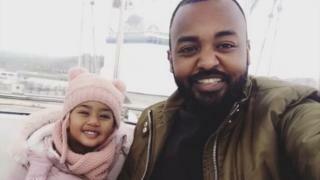 Mr Adem, 29, added: "I have a beautiful relationship with my daughter and I am so thankful for that, but I never imagined life would be like this."